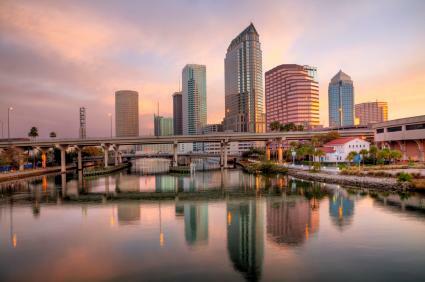 Tampa, Florida is a dream escape for anyone longing for fun in the sun. The tropical vacation destination is located along the Gulf of Mexico and boasts a bevy of spectacular attractions, restaurants and shops. Regardless of your age, the west central Florida city will keep you coming back for more, year after year. From family-friendly amusement parks, gorgeous beaches, awe-inspiring natural areas and a host of professional sports teams, Tampa has something for everyone. The Florida Aquarium: This undersea wonderland is filled with more than 20,000 plants and sea creatures housed in fresh and saltwater environments. It also boasts dozens of interactive exhibits, including a million-gallon coral reef display. If you are truly adventurous, then consider signing up to dive with denizens of the deep in the aquarium's Shark Bay exhibit. Hillsborough River: Nature lovers will enjoy getting up close and personal with the residents living along the Hillsborough River. Spend the day navigating the historic waterway in a rented canoe, and meet popular riverside residents such as herons, deer, otters and a variety of other animals. Hyde Park Village: Located in one of Tampa's oldest neighborhoods, Hyde Park Village is a mecca for popular retailers. Follow the shopping center's luxurious outdoor pathways to familiar stores, such as Restoration Hardware, Anthropologie, Williams-Sonoma, and Brooks Brothers. International Plaza: If you have money to burn in the sizzling Tampa heat, then head to International Plaza. The city's premier shopping center is adjacent to Tampa International Airport and attracts hundreds of thousands of shoppers to its upscale stores, including Tiffany and Co., Burberry and Neiman Marcus. Swiss Chalet Gift Shop/Tampa Bay Visitors Center: The unique structure does double duty as a superbly stocked souvenir shop and information center. Not only can you purchase one-of-a-kind local merchandise and staples, such as stamps, cameras, and postcards, but you can also buy tickets to tours, shows and other area attractions. Columbia Restaurant: The southern city is heavily influenced by the Spanish culture, and the Columbia Restaurant is no exception. Family-owned and operated since 1905, the iconic eatery offers colorful ethnic dishes such as paella and Spanish soup with garbanzos and chorizo. Catch Twenty Three: Located in trendy West Park Village the stylish seafood restaurant is a tropical paradise in and of itself. Island music plays in the background while servers dish up everything under the sea, from fresh calamari and shrimp scampi to yellow tail snapper and seared mahi. Pink Flamingo Café: If you are looking for cheap eats that are packed with flavor, then visit the Pink Flamingo. As the name implies, the restaurant is home to dozens of pale wading birds. However, the flamingos are not the only draw. The café serves up tasty down home dishes, including corned beef hash, turkey melts and crab cake Benedicts. Club Prana: From Latin to hip-hop, reggae and pop, Club Prana plays it all. The five-story, high-tech club features multiple dance floors, a rooftop bar, celebrity DJs, and an endless drink menu. Orpheum: Live music rules at the top-rated Orpheum. Local and national musicians take turns heating up the dance floor with their tunes. In addition, the club boasts a huge selection of draft beers, as well as several unique tropical libations. Empire & Climax: This massive nightclub is a haven for Tampa's night owls. Aside from its powerful sound system and enthusiastic DJs, the two-story club also has areas where you can play darts, drink and mingle. Before you solidify your Tampa travel plans, keep in mind that the Florida hot spot is a year-round vacation destination. Consequently, you will likely run into crowds regardless of when you travel. Fortunately, with so many things to see and do in Tampa, you won't be bumping elbows with visitors your entire trip. If you are wary of sharing space with large numbers of people, then pick up a Tampa, Florida travel guide or log on to the Tampa Bay Convention & Visitors Bureau's website to get tips on when to visit popular attractions.